I have different Device Collections for servers in different AD group. One collection called Server Pilot contains a group of pilot servers. I usually deploy security updates to this collection before we deploy updates to production servers. The membership rule is simple which is to query the AD group and put device in the group into this collection. Nice! It did update the collection instantly which can be told by the Update Time in Summary tab. But this did not fix my problem. I still did not see 2 new servers. I had to double check the collection settings and finally find the reason – the limiting collection! 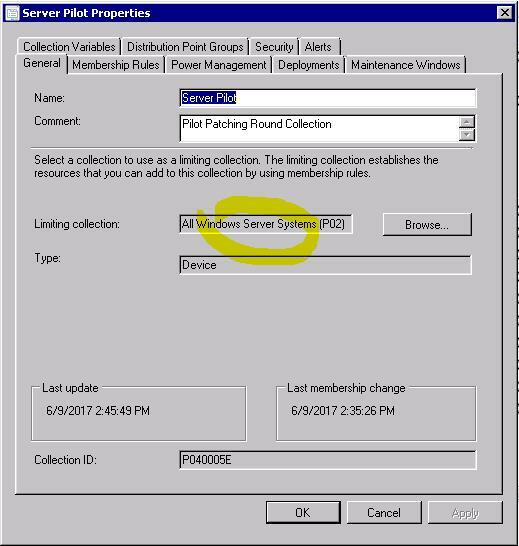 There is a limiting collection – “All Windows Server Systems (P02)” in the properties. Don’t fool by the name, somebody created this collection but not contains all windows servers like the two new servers! Since the limit collection did not has the two device, the Pilot collection did not has them either no matter how I updated it. I had to change the limiting collection to All Systems – means no limit. Then I used the same PowerShell command to update the All Windows Server System collection and update the Server Pilot collection again. Problem solved! Hanson on Windows Servers Failed to Install KB4093118 running Microsoft Windows Server 2008 R2 Standard SP1. JP Vermeulen on Windows Servers Failed to Install KB4093118 running Microsoft Windows Server 2008 R2 Standard SP1.